This bookmarklet allows you to copy selected properties from a source document to a set of destination documents from the same library and same document class. 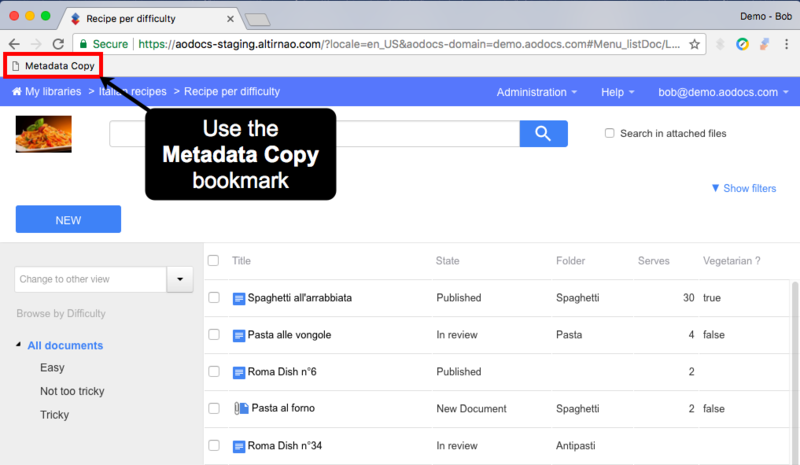 With the Metadata Copy bookmarklet, you can easily update the properties of several documents in one single operation. 1. After installing the Metadata Copy bookmarklet, open a list view of a library where you have contributor permissions. 2. Press Metadata Copy in your bookmark bar. The Metadata Copy pop-up opens. 3. 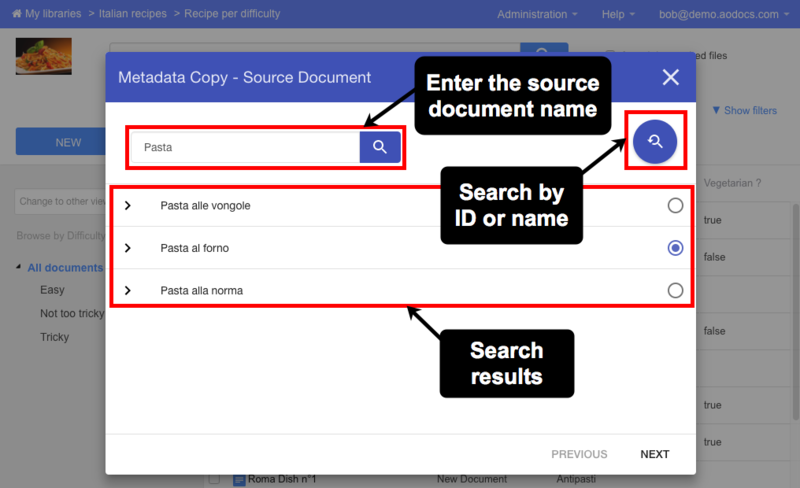 In the search bar, enter the name of the source document you want to copy the properties from. The search is case insensitive and allows keyword search. Note: The search doesn't support partial wording (for example, “appl” won't match a document titled “Apple”). 4. If required, press the switch button to choose between a search by ID and a search by name. 5. The search results are listed in the pop-up. Select the document to use as the source document. Note: If the list view is configured to filter documents based on specific criteria, the bookmarklet won't find documents that don't match the view’s filters. Learn more: Configure views in your library. 7. 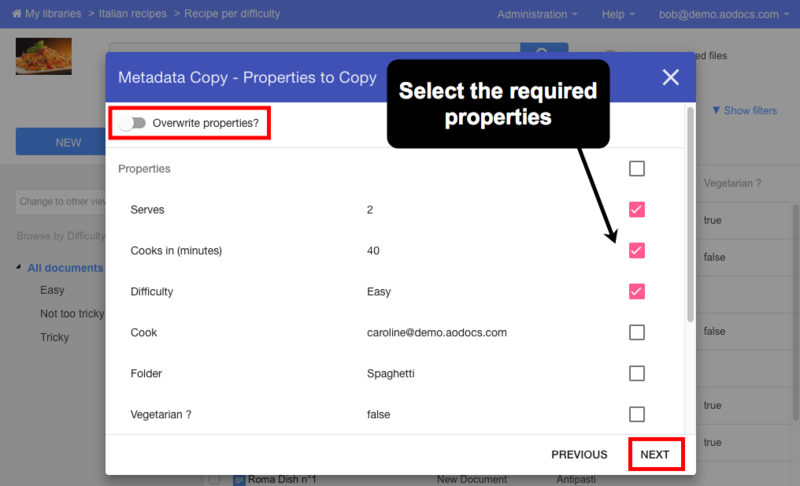 In the following screen, choose which properties of the source document you want to copy. The properties that are not selected with the checkboxes will be ignored by the bookmarklet. If Overwrite properties is turned on, the existing property values in the target documents will be reset before inserting the property values of the source document. For example, if a target document has a multi-valued field named Countries, which contains two values USA and Canada, and if the source document’s Countries field contains only Mexico, after the operation the target document’s Countries field will only contain Mexico. If Overwrite properties is turned off, the existing property values in multi-valued fields of the target documents will be preserved. For example, in the same case as above, after the operation the target document’s Countries field will contain three values USA, Canada and Mexico. Note: The bookmarklet can only copy custom properties. It can't copy system properties, such as document creator, last update date, creation date. 10. In the last screen, select the destination documents on which the properties of the source document will be applied. 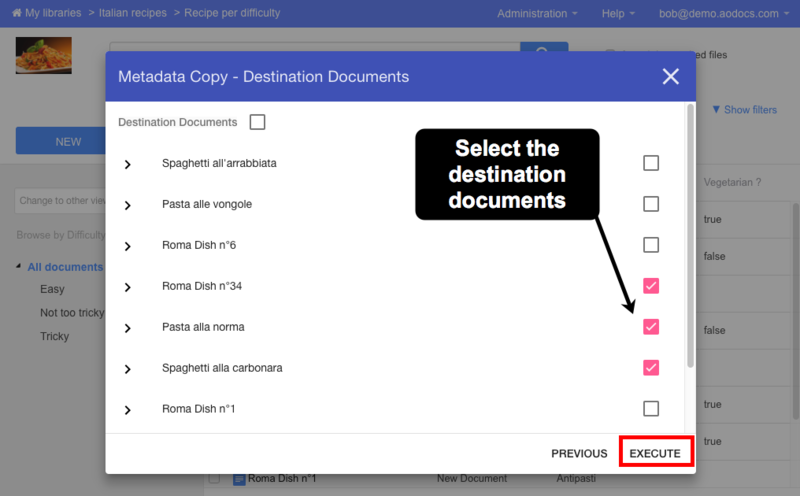 Note: You can only copy properties to destination documents that are displayed on the current page of your list view. You can configure the number of documents displayed per page in the list view, with up to 100 documents per page. This means the maximum number of destination documents that can be selected in the bookmarklet is 100. 11. Press Execute. A success message appears.